Reputation can seem like an endless grind, especially for factions that are outdated and rarely pursued. Reputation can be gained from questing, killing specific mobs, and completing specific dungeons, raids, and battlegrounds. Why go to the hassle of an endless and sometimes mind-numbing pursuit for reputation? It seems pointless in the long run, with endless hours, days, weeks, and months of grinding and questing for a few rewards which do not seem to matter for actual game play. When world of warcraft first began, reputation gains were necessary in order to obtain specific items such as for crafting. This is no longer the case. Today, the main reputation that affects game play is guild reputation which offers perks such as mass resurrection and faster leveling. From the many players I have met, most people do not pursue exalted reputations unless there is something to be gained from it, such as mounts, tabards, pets, titles, achievements, and so-forth. There are a few players who are considered to be "completionists" and simply enjoy filling that green bar to 999/1000 exalted status. I have played World of Warcraft since the beginning of Burning Crusades and have spent countless hours obtaining more than 60 exalted reputations. In my pursuit of completing these reputations I hit a lot of snags along the way. I hope to share a few tips, tricks, and strategies to making reputation grinding as painless as possible for those who are interested.This condensed reputation guide will provide basic information on how to obtain exalted status with reputations dating all the way back to "Vanilla Wow". Here are a few mounts available after gaining Exalted status with several reputations. Classic Reputations are the original World of Warcraft reputations. These appeared when the game came into existence and were made for players up to level 60. Most of these factions can be revisited with higher level characters and completed quickly. Argent Dawn- This reputation takes place in the Eastern Plaguelands. The quest chain starts with Fiona's caravan quests and ends with Lord Maxwell Tyrosus which will bring your status to "Revered". In order to become exalted there are repeatable quests with old dungeon objectives for the original Stratholme and Scholomance dungeons. Once exalted you will be granted an achievement. You will also need to be exalted with the Argent Crusade in order to complete the achievement and title "The Argent Champion". Bloodsail Buccaneers- "Insane in the Membrane" is an achievement and title which requires you to gain honored with Bloodsail Buccaneers and exalted with several other factions. Because you will also need exalted status with the classic steamwheedle cartel reputations there are certain mobs you cannot kill or else you will lose reputation with either faction. If you are pursuing the "Insane" Achievement you will need to grind Bloodsail reputation before you grind steamwheedle reputation. Start by completing the quest line from Sea Wolf McKinley. After talking to First Mate Krazz you will be able to start a quest chain to gain reputation with Bloodsail Buccaneers. Once the quests are complete, you must kill Booty bay bruisers to gain exalted status. It is a tedious grind because you are going from Hated to Exalted. I highly recommend utilizing the new Looking for Group feature which allows other players with a similar goal to join your group. A full group will make the grinding process a lot faster and easier, considering how hard the Booty Bay bruisers hit. To start, look at your reputation list under your character tab and click "At War" with Booty Bay. This will enable you to start killing mobs. Have no worries! Once you have completed this grind, you can gain back reputation with the steamwheedle cartel without compromising your Bloodsail reputation which is mentioned further down my list of reputation factions. Using a guild battle standard while killing bruisers will significantly increase your reputation gains. 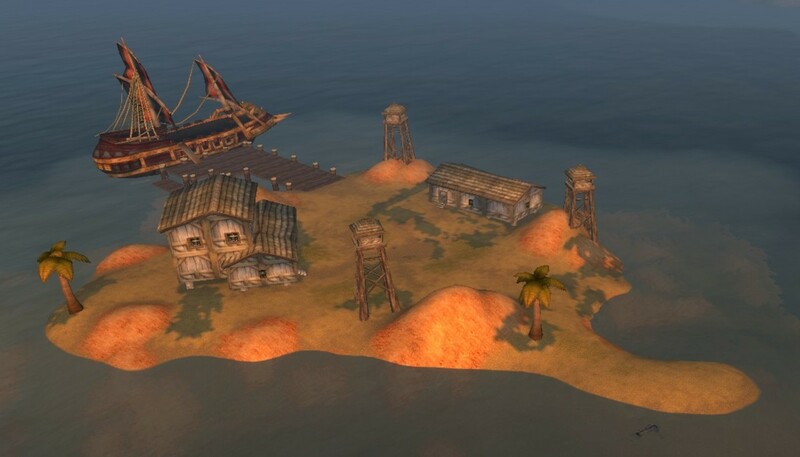 *Faldir's cove was once a good place to grind reputation for this faction. However, it has recently been "nerfed" and is no longer a good place to grind reputation. Brood of Nozdormu- You can obtain exalted status with this faction by running The Temple of Ahn'Quiraj, and original 40-man raid. There are also a few quests to help boost your reputation by turning in insignias and artifacts. It is a level 60 raid and can be solo'd very quickly. In fact, this is one of the easiest reputations to gain. An added benefit to running AQ is the opportunity to obtain mounts and pets. 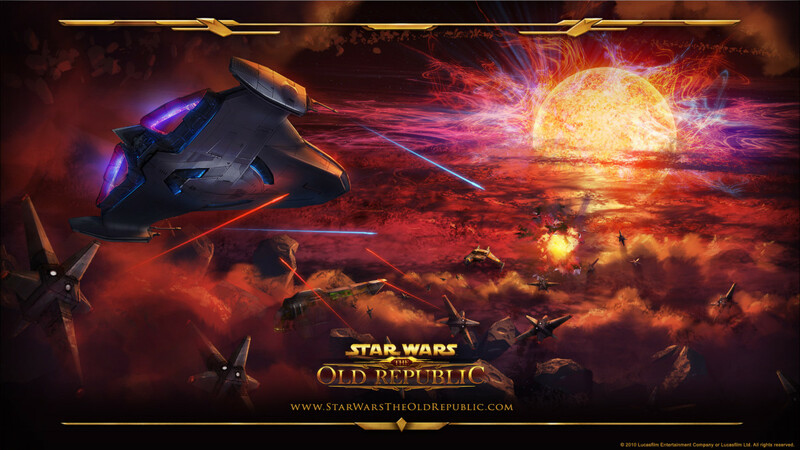 You will also be able to complete an achievement for earning exalted status. Cenarion Circle- Reputation for this faction can be gained by running the AQ 20-man raid, Ruins of Ahn'Quiraj. You can kill Twilight Cultists in Silithus for more reputation. These mobs also drop Twilight Texts which you can turn in 10 at a time for more reputation. Darkmoon Faire- The Darkmoon Faire is a week-long world event that gives players the opportunity to complete dailies as well as profession quests for reputation. The advantage to completing darkmoon quests is the chance to receive prize tickets. If you save up enough, you can buy different mounts and pets. Turning daily quests in will occasionally give you a "Darkmoon Top Hat" which will increase reputation gains at the Darkmoon Faire by 10%. This is also a reputation required for the "Insane in the Membrane" achievement. Hydraxian Waterlords- Reputation for this faction is still available from running Molten Core which is a raid that is now only available to cap-level players (currently level 100) during WoW's Anniversary celebration. Mobs in Silithus such as the Desert Rumbler will grant small amounts of reputation but only up to "Honored" status. It's not a difficult grind, but it takes a long time, especially since Molten Core is no longer available on a regular basis. 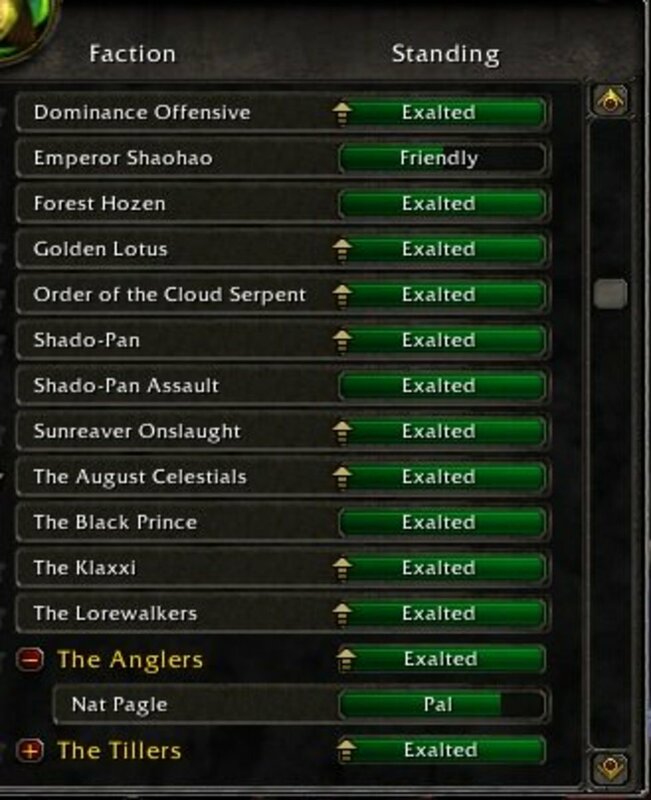 Gaining exalted with this faction will grant an achievement. Ravenholdt-Stormgarde Keep, Northfold Manor, and Strahnbrad are the best places to kill syndicates for reputation up until honored. 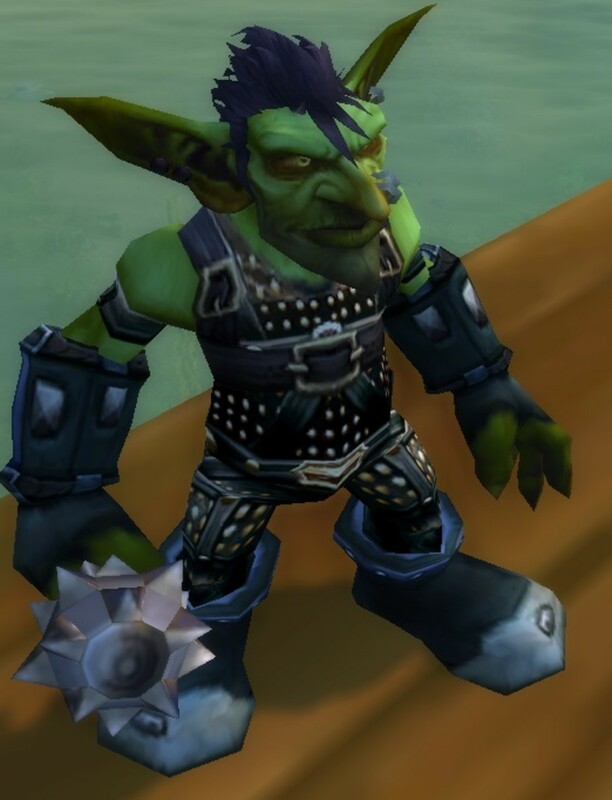 In order to obtain the remaining reputation you will need to have a rogue or hire a rogue to pickpocket Heavy Junkboxes from mobs such as in Lower Black Rock Spire or Blackrock Stronghold, to turn in for a repeatable quest. It is another reputation necessary for the "Insane in the Membrane" achievement. Thorium Brotherhood-Reputation for this faction has been simplified greatly. Quests in searing gorge and burning steppes will grant you a decent amount of reputation. By turning in items such as dark iron ore, core leather, fiery core, lava core, and blood of the mountain to Lokhtos Darkbargainer you can also gain reputation from neutral to exalted. Timbermaw Hold- Killing winterfall and deadwood furbolgs as well as bosses and rare mobs in the area will grant reputation. Grizzle Snowpaw will grant 100 reputation but only up until revered status. To help boost your reputation the quests "Winterfall Activity" and "Deadwood of the North" grant 700 reputation and make new turn-in quests available. Steamwheedle Cartel (Booty Bay, Everlook, Gadgetzan, Ratchet)- You will need these reputations to be exalted in order to get the "Insane in the Membrane" achievement. Bloodsail reputation should be completed first. Once you are ready to improve your steamwheedle reputation, there are cloth turn-ins at goblin cities such as Gadgetzan until you reach neutral. In order to avoid damaging your bloodsail reputation, the mobs you should kill are in Tanaris along the coast. Killing these pirates from Neutral to Exalted is quite a chore! I recommend bringing a group of 5 to your farming location in order to speed up re-spawn times. It took me hours to finally complete this reputation, and it is a lot more bearable to pursue this reputation as a group. Please note that these mobs will not give you the final points of reputation for Gadgetzan. In order to complete it, you will need to make your way southeast of Ratchet to Fray Island. Killing these mobs will give you gadgetzan-only reputation without damaging your bloodsail reputation. Using a guild battle standard will only improve your reputation gains slightly, but it makes all the difference when these mobs are only giving 2 or 3 reputation per kill. Syndicate- The only way to gain syndicate reputation is through killing ravendholt mobs. As of right now you cannot go past neutral with the syndicate and there is nothing worth pursuing this reputation for. Gaining syndicate reputation will severely descrease your ravenholdt reputation. These PVE reputations are now easy to obtain. Besides questing, a tabard representing the faction of your choice can be purchased. You can gain reputation by wearing specific tabards representing the different factions, in dungeons. Although it should go without saying, Horde reputations are gained strictly by the horde, while Alliance reputations are gained strictly by the alliance. PVP reputations used to have repeatable turn-in quests. These would allow players to exchange tokens for reputation. Now, the grind is much more pain-staking and players will only gain reputation based on their performances in specific battlegrounds. Brawl'gar and Brawlpub reputations are somewhat new to World of Warcraft. There are currently 2 seasons so far and involve fighting high-level mobs in Orgrimmar and Stormwind to test the strengths of your character. Your character will receive an invitation to participate in this fighting arena. Other reputations: Wintersaber Trainers- This faction (available to the alliance) will grant access to wintersaber mounts. Burning Crusade reputations were introduced during World of Warcraft's first expansion, the Burning Crusade, and were originally created for players up to level 70. Ashtongue Deathsworn- This reputation is primarily gained through running Black Temple. It is now very easy since the Black Temple raid is able to be reset and if you are at cap-level it is easy to solo clear. Theoretically you could gain exalted status in a matter of days with intense grinding. Cenarion Expedition-From netural to honored you can gain reputation by running the Slave Pens dungeon and killing Naga forces. You can also turn in quests with items such as "unidentified plant parts" and "uncatalogued species". From honored to revered you can run the Steamvault dungeon and turn in colifang armaments. Heroics will grant higher amounts of reputation and there will be quest lines to help boost your reputation gain. Completing this reputation will grant you an achievement and access to the cenarion war hippogryph. Keepers of Time- Running the Old Hillsbrad Foothills and Black Morass is the only way to gain reputation with this faction. Netherwing- In southeast Shadowmoon Valley of Outland, Mordenai offers a quest line to get you started with this reputation faction. This faction grants access to the netherdrake mounts. Many of these quests are dailies. It seems like a lengthy process, but it is pretty straight-forward as long as you stick to the quest line. Ogri'la- You cannot necessarily grind this reputation. The only way to gain reputation with this faction is through repeatable daily quests from these Ogres located in Blade's Edge, Outland. Sporeggar- Everyone starts out as unfriendly with this faction. Turn in big lord tendrils and mature spore sacs to Fahssn until friendly. Kill bog lords until honored, and kill marsh dredgers and lurkers until revered. Once you are friendly, quests will become available which will help boost your reputation gains. "Bring me a Shrubbery" is a repeatable quest for turning in sanguine habiscus for reputation. The Consortium- Completing the Mana Tombs dungeon and completing turn-in quests will get you to exalted with this faction. The Mag'har / Kurenai- Killing Kil'sorrow cult members, Murkblood Broken, Warmaul ogres, and Bloodmaul ogres will yield reputation for these factions. Turning in obsidian warbeads will also yield reputation. Gaining exalted reputations with these factions will grant access to the Talbuk mounts. The Scale of Sands- Reputation for this faction is gained from running the 25-man raid Hyjal Summit located within the Caverns of Time in Tanaris. The Violet Eye- Completing Archmage Alturus' quest line and running the Karazhan raid will grant reputation for this faction. Thrallmar / Honor Hold- Thrallmar is the Horde city in Hellfire Peninsula and Honor Hold is the Alliance city. These reputations can be gained through questing and running Shattered Halls, Heroic Ramparts, and Blood furnace. Tranquillen-This is a Horde-only faction and can be obtained through questing for this faction in the Ghostlands. It's a quick reputation to gain since most quests grant at least 1000 reputation apiece. Lower City- Running Auchenai Crypts, Setthekk Halls, and Shadow Labyrinth will get you to honored status with the Lower City. Continuing Shadow Labryinth and completing Lower City quests will get you to revered status, at which point you will need to run these three instances on Heroic to finally become exalted. The process is a bit time consuming but it is not difficult especially if you are playing on a high level character. Sha'tari Skyguard- This faction has two outposts, one near the skethyl mountains and the other near the Ogri'la in Blade's Edge. Four daily quests are available which grant reputation for this faction. Mobs such as Skettis Kaliri, Skettis Arakkoa, and Talonsword Forest ragers grant additional reputation points. The Riding Nether Ray mount becomes available after reaching exalted status with this faction. Shattered Sun Offensive- Questing and running Magister's Terrace on the Isle of Quel'Danas will give reputation up through exalted status. Added benefits to running this dungeon includes the swift white hawkstrider mount, phoenix pet, and the Orb of the Sin'dorei toy. The Sha'tar- Completing quests, pursuing scryer/aldor quest lines, and running the Tempest Keep (Botanica, Alcatraz, and Mechanar dungeons), will yield reputation for this faction. This is a very fast reputation to gain, especially because dungeons yield thousands of reputation points per run. Scryers / Aldor- Players will need to choose between Scryers and Aldor reputation in Shattrath City. Choosing a faction depends on what item rewards will benefit your class the most. 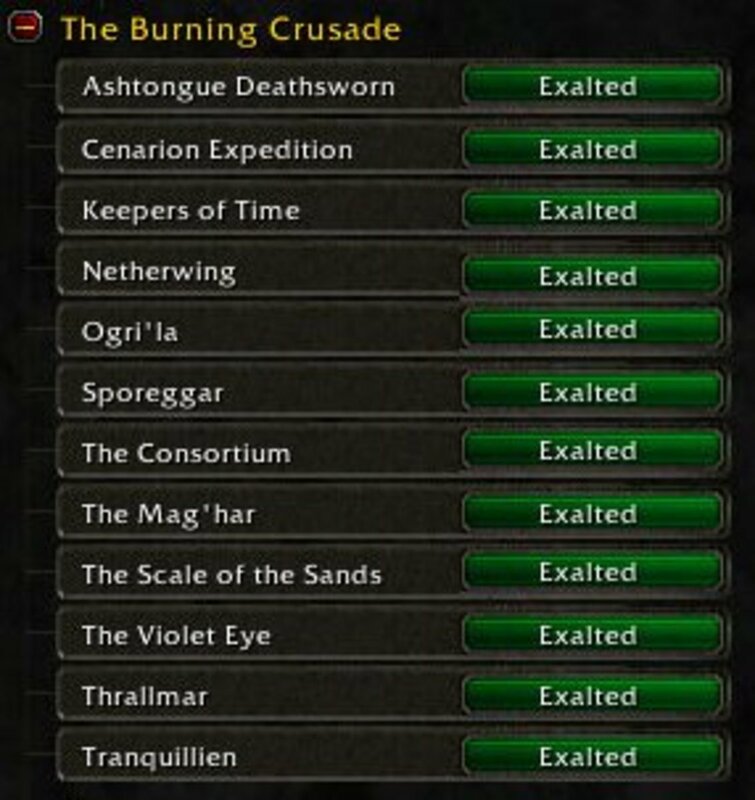 This reputation was important for the Burning Crusades expansion, however it is no longer useful for players who plan on playing beyond level 70. If you are still interested in pursuing these factions, reputation can be gained through completing quest lines. Scryer players can turn in firewing signets, Sunfury signets, and Arcane Tomes while the Aldor players can turn in Marks of Kil'jaeden, Marks of Sargeras, and Fel Armaments for more reputation. The Hero of Shattrath Achievement can be obtained from gaining exalted status with both factions. One you are exalted with one faction, you can grind reputation for the other faction which will result in loss of reputation with your first chosen faction. This will not affect your pursuit of this achievement. Wrath of the Lich King is World of Warcraft's second expansion originally created for players up to level 80. Icecrown Citadel was a prominent point of this expansion where players raided to take down the Lich King and his forces. Argent Crusade- This is a great reputation to pursue because it counts towards 4 separate achievements including Northrend Vanguard and the aforementioned "Argent Champion" achievement and title. Questing and killing crypt slayer mobs in the Eastern Plaguelands will help you get started with this reputation. Once you are friendly with this faction you can purchase a tabard to wear in Utgarde Pinnacle, Culling of Stratholme, Oculus, and Halls of Lightning dungeons to gain more reputation. Kirin Tor- This is a group of wizards in Dalaran. Like the Argent Crusade, there is a tabard you can purchase to wear in dungeons for Kirin Tor reputation. You can also purchase reputation tokens from the justice quartermaster in Dalaran and complete cooking, fishing, and instance dailies for additional reputation. Knights of the Ebon Blade- Death knights start out as friendly with this faction after completing their starting zone as a new character. Any player can gain reputation with this faction through quest dailies next to the Shadow Vault, use of a tabard in dungeons, and reputation tokens from the justice quartermaster in Dalaran. This is one of several reputations needed for completing the Northrend Vanguard achievement. The Ashen Verdict- The Icecrown citadel raid and Shadowmourne quest line from Highlord Darion Mograine of Icecrown Citadel, grants reputation for this faction. The Kalu'ak- Quests and daily quests are available to gain reputation with this faction. Reputation can no longer be gained from the Kalu'ak fishing derby since this event has been retired from the game. The Kalu'ak is situated in Kaskala, Borean Tundra. They can also be found in Kamagua, Howling Fjord and Moa'ki Harbor, Dragonblight. The Sons of Hodir- This faction of Ice Giants is located in the Storm Peaks. Quests, daily quests, and purchasing of reputation tokens from the legacy justice quartermaster in Dalaran will help you to begin gaining reputation with this faction. In addition, there are turn-in quests for everfrost chips and relics of ulduar. The Wyrmrest Accord- This faction can be found in Coldarra, Borean Tundra and in Wyrmrest Temple, Dragonblight. 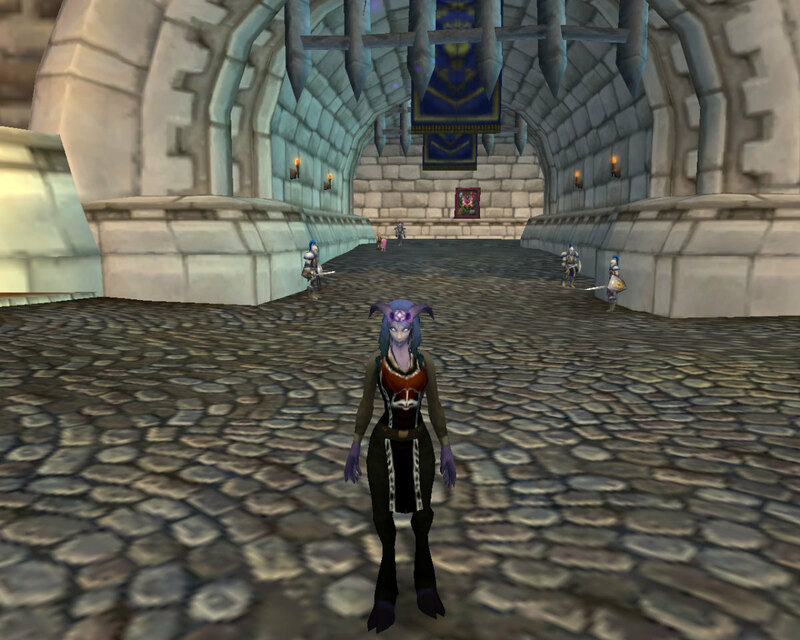 Quests, dailies, wearing the faction's tabard in Northrend dungeons as well as purchasing reputation tokens from the Dalaran legacy justice quartermaster are all ways of gaining reputation with this faction. This reputation counts towards the Northrend Vanguard achievement. Frenzyheart Tribe / Oracles- These factions are found in Sholazar Basin. You can become exalted with either through a series of quests from either the Frenzyheart Tribe or the Oracles. An achievement is available for gaining exalted with both. You can only be exalted with one at a time. Since reputation is gained through completing dailies, it is time-consuming, but not difficult, to switch. You can switch multiple times if necessary. Switching requires engaging Artruis the Heartless in battle at which point you will declare your allegiance to one faction or the other. If you are committed to pursuing the achievement, I would recommend becoming exalted with Frenzyheart first and then the Oracles since the Oracles vendor offers an egg with a 5% chance to drop a green proto-drake mount. It may take quite some time before you get lucky enough to obtain this mount. Horde Expedition- Northrend heroic dungeons will grant reputation for the Horde Expedition in addition to spillover reputation for the following four sub-factions. Exalted rewards include Mechano-Hog mount schematics for engineers. The Hand of Vengeance- Several Dragonblight and Howling Fjord quests will grant reputation for this faction in addition to Horde Expedition spillover reputation from heroic dungeons. The Sunreavers- This reputation can be gained from roughly one solid month of completing Argent Tournament dailies in Icecrown. The Taunka- Several Borean Tundra and Howling Fjord quests will grant reputation in addition to Horde Expedition spillover reputation from heroic dungeons. Warsong Offensive- Quests throughout Northrend will grant reputaiton in addition to Horde Expedition spillover reputation from heroic dungeons. Alliance Vanguard- Like the Horde Expedition, the Alliance Vanguard has four sub-factions. Reputation for the Alliance Vanguard is obtained from Northrend Heroic dungeons. Exalted rewards include Mekgineer's Chopper mount schematics for engineers. Explorer's League- Quests from Storm Peaks and Howling Fjord zones will grant reputation in addition to spillover reputation from the Alliance Vanguard. The Frostborn- There are a few Storm Peaks quests which grant reputation in addition to spillover reputation from the Alliance Vanguard. The Silver Covenant- This faction is similar to the Horde's Sunreavers faction. Reputation is gained from Argent Tournament dailies in Icecrown. Valliance Expedition- Various quests from Howling Fjord and Dragonblight will yield reputation for this faction in addition to spillover reputation from the Alliance Vanguard. Cataclysm was World of Warcraft's third expansion which allowed players to advance up to level 85. Avengers of Hyjal- The only way to gain reputation with this faction is to run the Firelands raid in Mount Hyjal. Heroic raids grant reputation than normal raids. All mobs grant reputation until honored, at which point only larger trash mobs and bosses will grant reputation. Like the Molten Core raid, only bosses will grant reputation from revered to exalted. Dragonmaw Clan (Horde) / Wildhammer Clan (Alliance)- Twilight Highlands quests in addition to wearing faction tabards to Cataclysm dungeons will grant you reputation for these factions. Guardians of Hyjal- Mount Hyjal quests, dailies and use of a faction tabard in Cataclysm dungeons will grant you reputation for this faction. Hellscream's Reach (Horde) / Baradin's Warden (Alliance)- These factions exist in Tol Barad where daily and PVP quests are available. These grant reputation as well as Tol Barad tokens for special rewards such as mounts and pets. The Baradin Hold raid will become available to whichever faction gains control of Tol Barad. Additional reputation will be granted from this raid. Ramkahen- Uldum quests and daily quests in addition to use of this faction's tabard in Cataclysm dungeons will grant reputation. Camel mounts will become available to exalted players. The Earthen Ring- Vash'jir, Deepholm, and Twilight Highland quests will grant reputation for this faction. Tabard use for this faction in Cataclysm Dungeons will also grant reputation. Therazane- Quest lines, dailies, and use of a tabard for this faction in Cataclysm dungeons will grant you reputation. Mists of Pandaria was World of Warcraft's fourth expansion created for players up to level 90. Dominance Offensive / Operation: Shieldwall- The Dominance Offensive is the Horde reputation located in Krasarang Wilds, and Operation: Shieldwall is the Alliance reputation located at Lion's Landing in Krasarang Wilds. Both factions have a "Meet the Scout" starting quest. Completing the quest lines will grant you reputation with your faction (horde or alliance, respectively). New quest lines become available when your reputation status with the faction increases. Exalted status grants access to a new mount for each faction. Emperor Shaohao- This faction gives access to daily quests for reputation. Other than that, you will be stuck grinding Yaungol mobs on the island. There are rewards such as mounts and pets available when you become exalted. I highly recommend organizing a group of other players who are also interested in grinding this reputation, and using a guild battle standard to increase your reputation gains. It will make the journey a lot less painful. Forest Hozen / Pearlfin Jinyu- These factions (horde and alliance, respectively) can be gained through completing quest lines in the Jade Forest. Golden Lotus- Things have changed since the 5.4 patch. 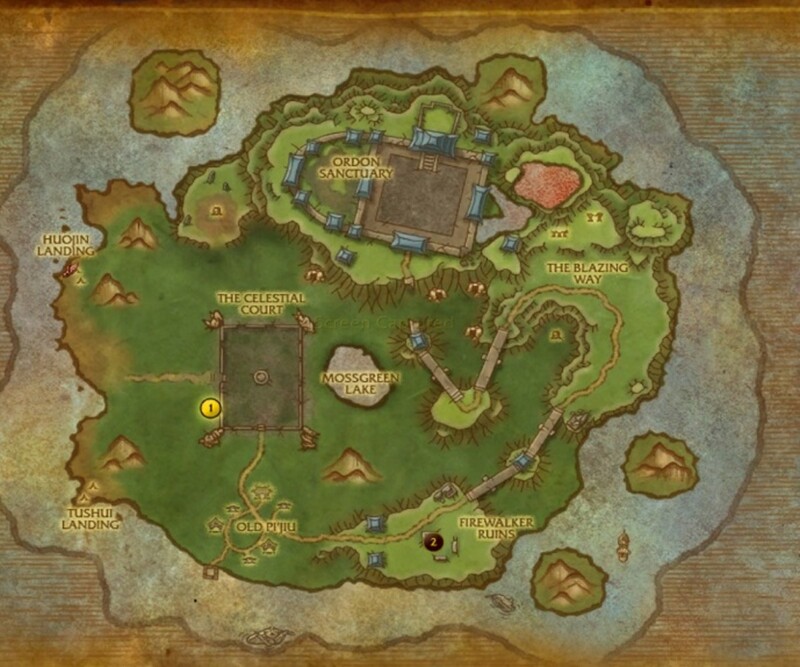 There are still quests available in the southwest of the Vale at the setting sun garrison, but the new primary mode of gaining reputation with this faction is from killing mobs in the Vale of Eternal Blossoms such as the Mogu at Guo-Lai Halls. These mobs have a chance to drop cache keys to open chests with Relics. When these relics are used they will grant additional reputation. 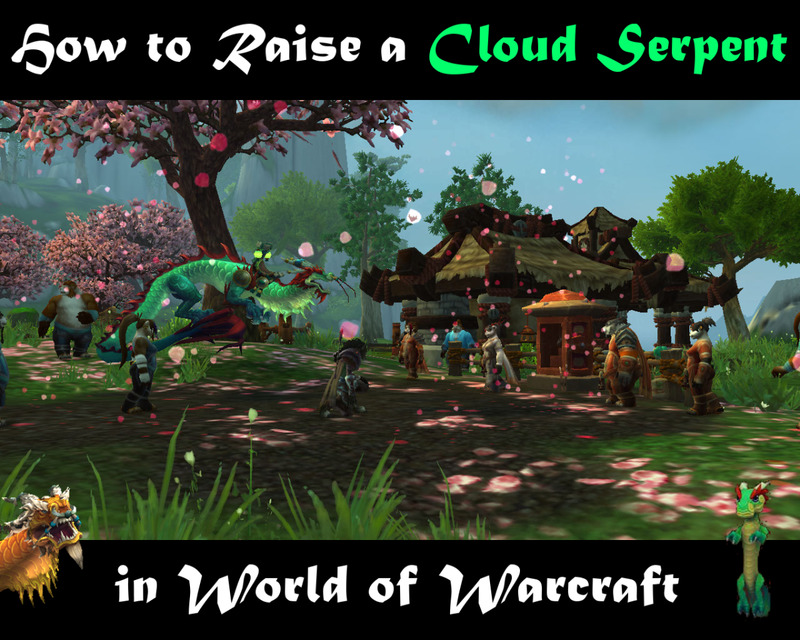 Order of the Cloud Serpent- Exalted status with this reputation faction grants access to the cloud serpent mounts. This reputation is a lot better than others. There are dailies available, as well as eggs hidden all around Windward Isle which can be turned in for additional reputation. Shado-pan- Revered with the Golden Lotus is no longer needed to unlock this faction. Work orders at the Sunsong ranch grant reputation. 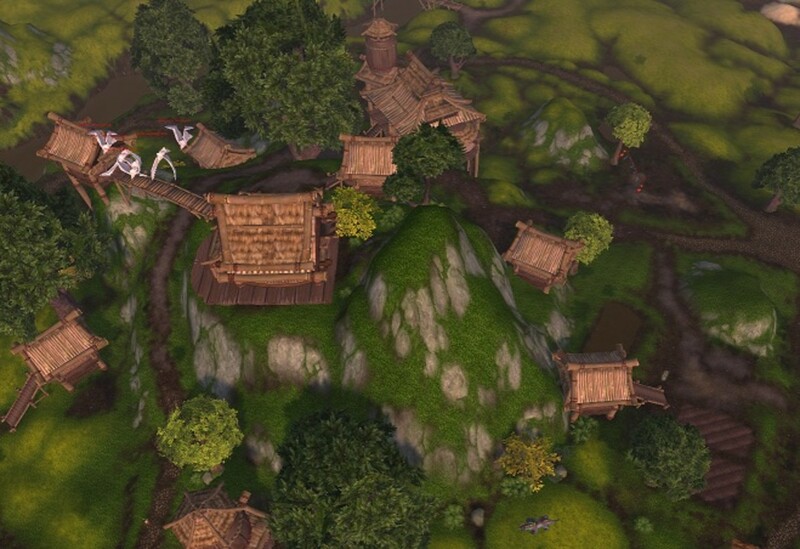 Quests and dailies are available in the western part of Townlong Steppes. There are several achievements and a title associated with this faction. Shado-pan assault- The Shado-pan assault is separate from the Shado-pan faction. Some quests and dailies on the Isle of Thunder will grant reputation for this faction. However, a bulk of your grinding will come from running the Throne of Thunder Raid. By creating a group in the Looking for Group tab you can find others who are interested in running this instance. There are popular items for transmorgification (transmog, xmog, etc.) as well as potential mounts and pets from running this raid. Sunreaver Onslaught / Kirin Tor Offensive- These factions (Horde and Alliance, respectively) are based on the Isle of Thunder. Quests and dailies are available to gain reputation with these factions. August Celestials- To begin gaining reputation with this faction talk to Sage Lotusbloom (horde) or Sage Whiteheart at your shrine in Vale of Eternal Blossoms. These quartermasters will give you daily quests to complete for reputation. The Black Prince- Wrathion grants a legendary quest line in chapters. These are translated into achievements once completed. You can gain reputation with the Black Prince from pursuing the quest line as well as from killing Mogu and Mantid mobs from Townlong Steppes and Dread Wastes. To gain reputation from revered to exalted you will need to kill mobs on the Isle of Thunder. The fastest way to do this is to kill Animated Warriors and Shan'ze Animators. The Klaxxi- This faction provides a very long quest line in the Dread Wastes in addition to dailies. Completing these quests will get you to exalted fairly quickly. The Lorewalkers- You will need to find scrolls throughout Pandaria. When you find all scrolls from one region you will receive a quest to complete and turn in to Lorewalker Cho at Mogu'shan Palace. The Anglers & Nat Pagle- Gaining reputation with the Anglers requires you to complete dailies from the Angler's Wharf in Krasarang Wilds. Soggy's Gamble quests in the dread wastes will also increase your reputation with this faction. Nat Pagle is the leader of the Anglers and has his own sub-reputation which will allow you to become his best friend. 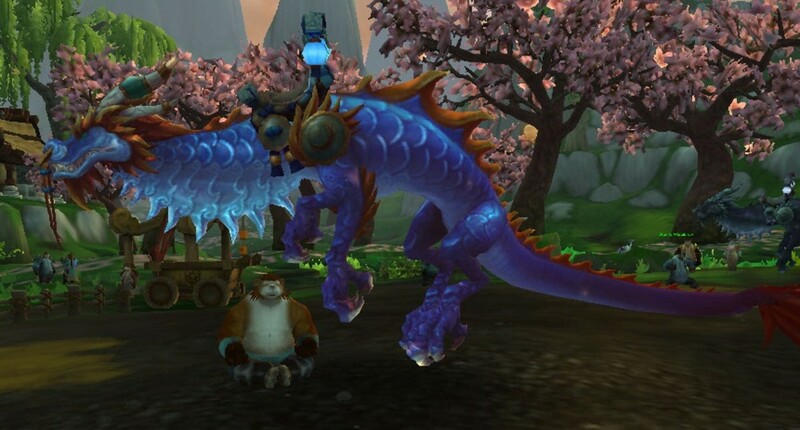 In order to do this you can fish in Pandaria and loot special items which can be turned in to him for reputation. All rewards for this faction are purchased from Nat Pagle. The Tillers & 10 best friends- The Tillers are located at Halfhill Market and Heartland in Valley of the Four Winds. This reputation is gained through quests and daily quests. Your quest line will start with Farmer Yoon who will show you how to take care of the farm where you can grow certain mats for cooking and crafting. Similar to Nat Pagle, there are 10 individuals who you can become best friends with. To do this, give them items that they like. For example, Chee Chee likes Blue Feathers and Ella likes Jade Cats. These items can be found in dirt mounds all around Pandaria, but primarily in the Heartland area of Valley of the Four Winds. Andi is a young pandaren child hanging around the market area who will grant you a daily quest to give a gift for one of the ten followers which will grant reputation for the individual as well as the Tillers faction as a whole. Gaining all best friend statuses will grant you an achievement. Advantages to completing the Tillers reputation includes access to new mounts. Please note that many of these factions give additional reputation such as through work orders at Sunsong Ranch as well as through Grand Commendations which apply a reputation boost account-wide found at that faction's corresponding vendor. Another way to gain additional reputation is from insignias dropped by Zandalari Warbringers or relics found in caches when applicable. 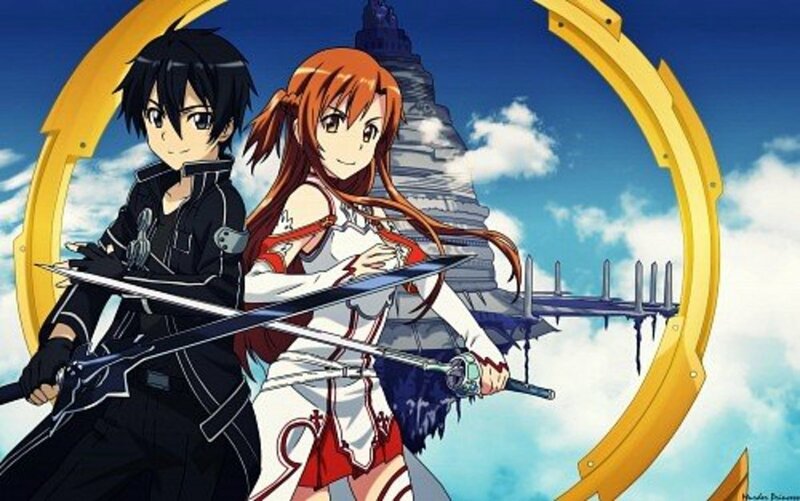 Using your guild battle standard (Battle Standard of Coordination) you will gain reputation much more quickly during your grind. Warlords of Draenor is the fifth and currently most recent expansion for World of Warcraft with a new level cap of 100 and several new and exciting reputations, titles, and achievements to pursue. Arakkoa Outcasts- The best way to begin your Arakkoa reputation is from completing the Arakkoa quests in the Spires of Arak zone in Draenor. The Lost Veil of Anzu, which is east of Sethekk Hollow in the Spires of Arak, contains level 100 mobs you can grind until Exalted. The fastest way to do this is to start a group in the Looking for Group section. Additional ways to gain reputation for this faction is from completing follower missions which grant Relics of Rukhmar. These are account-bound and can be sent to any character. Use a guild battle standard to boost your reputation. Frostwolf Orcs / Council of Exarchs- Frostwolf is the Horde reputation which can be gained from completing Frostfire Ridge quests and killing level 100 mobs in Magnarok or Stonefury Cliffs. Getting a group together will make the process much faster and make the respawn rate a lot faster. Bonus objectives and Apexis dailies for these areas can be done at the same time if you want to kill two birds with one stone. The Council of Exarchs is the Alliance reputation in Shadowmoon Valley. In addition to quests, bonus objectives, and apexis dailies, there are level 100 mobs which grant reputaiton in Socrethar's Rise and Darktide Roost. Use a guild battle standard to boost your reputation. Laughing Skull Orcs / Sha'tari Defense- Laughing Skull is the Horde reputation and the Sha'tari Defense is the Alliance reputation. Both require having a level 2 trading post at your garrison, which make these reputations available. The best way to farm Laughing Skull rep is to get a group together and farm level 100 mobs in the Pit. The best way to get a continuous flow of people to dedicate their time to this impossibly long grind is to create a group on the same day as the Pit Apexis Daily quest. Keep in mind the apexis quest can only be completed with up to 5 members, rather than in a raid group. You will also gain maximum reputation this way from each mob. Everbloom Wilds is an alternative farming spot. The Sha'tari Defense is very similar except the mobs you need to kill are in Shattrath and Bladefury Hold. A group of 5 seems effective for farming these mobs as well, and an added bonus is use of the garrison ability Artillery Strike. Both factions grant a new follower, mount, pet, and cosmetic items. Use a guild battle standard to boost your reputation. Steamwheedle Preservation Society- Not to be confused with the Steamwheedle cartel, this faction is located in Nagrand in Draenor. Highmaul Relics and fragments can be traded for reputation. In addition, killing certain rare elite beasts such as Vileclaw and Direhoof (there are a total of 9 rares) will drop special items to turn in for 500 reputation each. Rewards include mounts, pets, and a tabard among other items. It is not a difficult grind but it may take a bit of time if you are not in a group. Voljin's Spear / Wrynn's Vanguard- These are the Ashran PVP factions in Warspear. Voljin is the Horde side and Wrynn is the Alliance side. Quartermasters are in your respective bases. Completing quests and objectives in this outdoor PVP zone will grant you reputation. Rewards include a mount, tabard, PVP gear, and a title. Bodyguard Reputations- Specific Followers at your garrison will have the Bodyguard trait. These followers can be assigned to your Garrison Barracks. Killing any mobs which grant XP or honor, or at max level while having your bodyguard follower with you, will give you reputation with your bodyguard. The below video will show you some of the faster spots for grinding reputation with your followers. Keep in mind that you cannot take a follower to another place via flight path. If your follower dies you have to go back and get them, and there is a period of time before they can re-spawn in your garrison. I highly recommend Wowhead.com for any additional specific information about reputation. Wowhead stays up to date for the most part and you can filter posts by patch date to get accurate information after new patch changes. Simply use the search box to find what you are looking for. Most reputations for this website will also show up if you simply search Google or any other search engine. 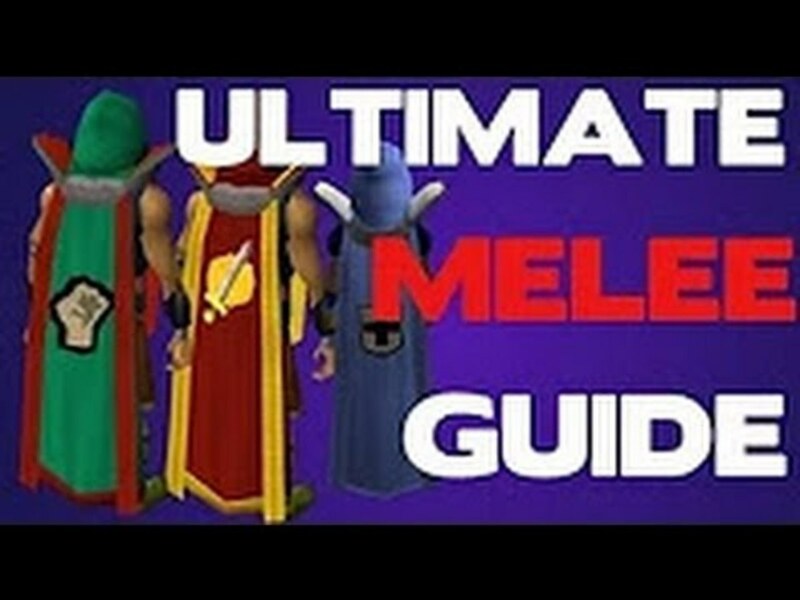 Youtube.com can also be very helpful provided that you can find accurate walk-through videos which are thorough and fairly short. Thank you for reading my condensed World of Warcraft Reputation guide. If you have any specific questions, feedback, or updates please post them here. If you need help with a specific faction I would be more than happy to answer your questions and send you resources for more information including accurate youtube walk-through videos. Grinding reputation can seem like a painful and endless process, even for the most dedicated and tenacious players. I hope that this condensed guide will help you break down the basics of what needs to be done to accomplish exalted status with each faction. Good Luck, and Happy Grinding! Thanks for this very useful summary. I just returned to WoD aftr 15 months and have a lot of rep to GRIND for. Great hub title too. That so completely describes what WoW reputation is about.